Being first time parents, we were making a decision about our child’s first school experience. We found it to be very emotional and challenging because we were presented with many options in our area and we also lacked the experience. L&P provided a family-like feel that was unique, stimulating and nurturing for our daughter. Her comfort was so important to us in making this decision. The truth lies within your child’s happiness. Our daughter has been going to L&P and will continue with this exceptional program until she departs for Kindergarten. I have been very happy with Learn and Play Preschool from the start. My son LOVES it! He is learning so much and is really thriving. I have actually had difficulty getting him to come home with me at the end of the day. One of the things that I like most about Learn and Play is the size. It’s a good balance of being small enough for the children to get one-on-one attention, but also big enough to have plenty of space to play and learn as well as a great curriculum and special activities. My son is 3 ½ years and with that comes those three year old challenges. I reached out to his teacher for suggestions and guidance on how to deal with some of those challenges. She was GREAT. She took the time to help and offered great suggestions. There has been wonderful teacher/parent involvement and communication. I would highly recommend Learn and Play Preschool. Our four year old child is in his second year at Learn and Play Preschool and it has been a wonderful and enriching experience for him. The teachers are warm, caring and informative and the classrooms are bright, spacious and cheery. The curriculum keeps the children interested and excited about learning. To keep the parents informed, a daily sheet is posted outlining the activities that took place throughout the day. This enables the parents to engage their children in a conversation about their day. There are several activities throughout the year that gets parents involved such as field trips, picnics at the beginning and end of the school year and Gingerbread House making. Our experience has been wonderful at Learn and Play Preschool and we’re confident that our son will have no problem academically transitioning to kindergarten. We have two daughters, ages 4 and 2, at Learn and Play. We switched our daughters from a day care center to Learn and Play over a year ago and it has been a positive experience for everyone. We really like the classroom atmosphere, the teachers are caring and dedicated and most importantly, our daughters love going to school. They enjoy making crafts, learning new songs, and playing with their friends. This year our 4 year old has started to emerge in recognizing letters and is learning to write, as well as learning skills that will help with the transition to Kindergarten next year. Our 2 year old is also thriving. Some of their favorite activities at Learn and Play have been the Show & Tell days, PJ days, apple picking in the fall and the spring field trip to the farm. We have both our 2 and 4 year old children attend Learn and Play Preschool. Our oldest child started before he was 2 years old. L&P has the level of expertise expected from a bigger chain of child-care centers, but with the “home-like” atmosphere that we wanted for our children. As a working parent, you need peace-of-mind that all aspects of your child’s needs are taken care of. The staff are experienced and provide a loving environment that our children excel in. The curriculum is stimulating from an academic perspective, but also incorporates emotional development and most importantly to us, a sense of fun and exploration. We could not be happier with our experience. Our daughter was blissfully happy at Learn and Play’s full-day preschool program. The regular school day, along with the many enrichment programs, Imagimotion classes, outdoor play, and seasonal projects and activities kept her engaged, entertained and challenged. Our daughter made some great friends at Learn and Play — ones she still sees today. The program’s teachers were compassionate and thoughtful, and provided just the right amount of supervision and order. Learn and Play Preschool was a good mix of needed childcare and a structured preschool program — a great stepping stone to Kindergarten. Evan, attending Learn and Play Preschool 2008. One morning, Evan started singing the “Way Up High in the Apple Tree” song. I love how Miss Elaine incorporates their music, artwork, books, snacks, etc. to the time of year/season. And after only 8 weeks, he started singing the alphabet and stopping at the letter they’re focusing on that week… amazing. If I asked him what his favorite part of school is; he would say playing outside and the sandbox, a typical boy. Learn and Play Preschool is a warm, friendly, and inviting place! My son William (age 4) is in his second year at Learn and Play. He started out at the white school with Miss Kim, Miss Darcie & Miss Lori in the center of town (and still talks about them) and now attends the red school with Miss Elaine & Miss Tina. William loves his teachers and has made some really great friends. He looks forward to school each week and especially enjoys the Imagimotion program. I cannot say enough about Miss Stacey, Miss Shelley and their wonderful school! We have three children who have all attended Learn and Play Preschool since the school began in 2002. We have had a wonderful experience with the very talented and devoted teachers at the school. The curriculum is fun and our children have enjoyed learning in this caring environment. There are well planned field trips to Davis Farmland, apple picking and even train rides to Concord on the train. Our daughter was one of the first graduates from Learn and Play Preschool in 2005, and our son recently graduated in 2008. Both of our children participated in the end of year school play and graduation ceremony, and loved it! These events were a fabulous ending to their years at Learn and Play Preschool, and a very special time for us to enjoy seeing how much our children have grown. This will be our last year at Learn and Play Preschool, and we will always be thankful to Stacey Regan and her staff for providing such a wonderful preschool experience. My daughter went to Learn and Play for three years; my son is in his second year with two to go; and I can’t say enough good things about their programs. The classrooms themselves are cozy, fun, and homey. The curriculum provides a great balance between structured activities and free play. The hours are flexible in a way I haven’t encountered in any other local preschool. The teachers are warm, friendly, competent, and experienced, and there’s almost no staff turnover at all–my son has gotten to have teachers my daughter had three years ago, which is a wonderful experience. Both the kids and I have met a ton of good friends there. And above all, I feel so comfortable and secure with the school that I’ve been able to go back to work part-time this year. It’s just a delight to have such a good relationship with a preschool/child-care provider. As a parent, I’ve been so happy with my experience at Learn and Play Preschool. My daughter started in the Toddler program last year and the caring, attentive teachers made her first school experience such a positive one. She is now in the Preschool program, and continuing to thrive in the dynamic and supportive environment Learn and Play provides. In addition, the physical space that Stacey and the Learn and Play teachers have created is exceptional- new and spacious, warm and inviting- just right for little explorers. Our two children attended Learn and Play for 5 years between them. They looked forward to each day of school. I love the nurturing environment and they love all the activities and friends they have made. Since they began attending Learn and Play, I have seen real growth in their independence, confidence, early learning skills, and social skills. The teachers at Learn and Play are so creative with crafts, monthly themes, and special events like holiday parties, pajama day, and a trip to Drumlin Farm. I know the teachers care tremendously for each and every student. Learn and Play Preschool combines the warmth and intimacy of what you would find in a family daycare with the education of a top preschool. Learn and Play has been a joy for our family! Your search is over. I had my two children attending Learn and Play Preschool from 2002 until the spring of 2008. I could not endorse this school more wholeheartedly. The friendly, warm and nurturing environment created by the teachers gave my children an enthusiasm for learning that they have taken with them into elementary school. It is crucial that a child’s educational voyage begins as stimulating, enriching and rewarding as possible. Let your child’s voyage begin at Learn and Play Preschool. Learn and Play Preschool has provided a nurturing, comfortable environment for our children’s introduction to organized learning. We have been with L& P since 2004, from toddlers to pre-Kindergarteners, and have had the same caring, involved, well-educated teachers throughout. It’s a nice balance of play based learning, age-appropriate curriculum units, and ‘special’ activities. Some of the activities that have loomed large in our memories are the field trip to the fire station, the school play production of Peter Pan, and following the life cycle and hatching of butterflies! We highly recommend Learn and Play! Gabe is 2.5 years old and has just started his second year in the toddler program. He loves it and so do I! He especially enjoys the sensory table and is always proud of the art projects that he frequently brings home. Gabe really trusts his teachers, so I trust them too, and I feel good knowing that I am leaving him somewhere he is comfortable. Compared to other places we considered, Learn and Play has a much more personalized, warm environment, with the right balance of individual attention and learning group skills. We’ve had a great experience so far and plan to send him to the preschool program next year. Our son is in his second year at Learn and Play and is currently in the Pre-K class. He started last year in the preschool room and had a wonderful experience. We were anxious about how he would do at school, since it was going to be his first experience in any sort of school setting (having never gone to day care), and also knowing his nature of being a very shy child with a very strong attachment to me, his mother, and lots of separation anxiety. However, from his first day of orientation, we knew we made the perfect choice with Learn and Play. The teachers are outstanding and are exactly the kind of teachers that a child like our son needed with his first school experience. The level of communication between them and the parents is remarkable, since at one point we were emailing almost daily with his preschool teacher to discuss how he was doing, since he continued to have separation issues at drop-off for weeks. The teachers are nurturing, truly interested in each student and their needs, and committed to their work. They are willing to do whatever they can to help you and your child individually with whatever you need to help your child succeed. The focus of the school really seems to be learning through play and our son has just thrived, loving school and all he does there. The physical set-up of the school and classrooms is like a house, so it is such a warm and welcoming environment to go to on school days, something that I think had and still has a significant impact on someone like our son who had so much anxiety about going to school in general. I can’t say enough good things about Learn and Play, we have just been so pleased with it, so much that our 2 year old daughter will be starting there next year! Learn and Play, in Acton, is an amazing preschool. Our twin girls are in the toddler program and we could not be happier with all the activities and great experiences they have enjoyed. 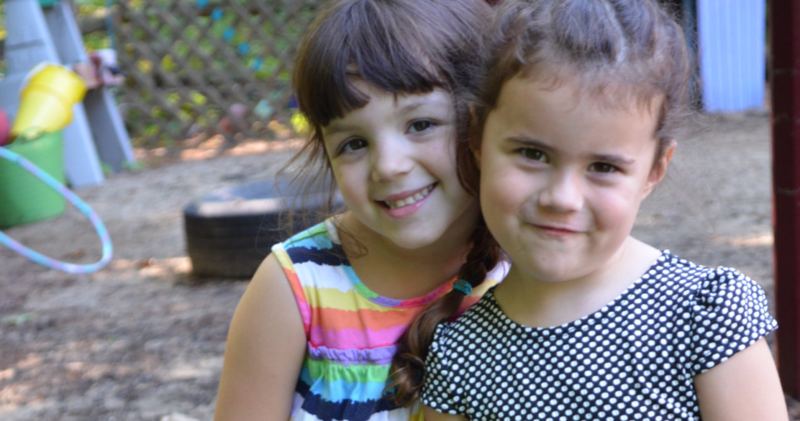 They both have made friends and love to share with us what they have done each day at school. They enjoy Imagimotion twice a month and learn all about a specific shape, color and theme each month. A favorite for the whole family is the “What they did for the Week” email sharing the activities they did, books they read, snacks they ate, Circle time songs and pictures of the children enjoying and participating in the activities. Additionally, Learn and Play is a family owned preschool with staff that has worked at the school for many years. Being a teacher of young children and a first time parent I found myself searching and searching for just the right place for our 3-year-old daughter. When I walked into Learn and Play I could tell right away this was a perfect fit. The classrooms are all so warm, inviting, and filled with lots of fun things for kids to do. My daughter comes home happy everyday and brings home several projects a week! She loves working on the letter of the week and having Show and Tell. They take field trips and have in house enrichment programs like Imagimotion, which is an added bonus to an already rich program. Above all of this is the wonderful staff of teachers. Because my daughter is there everyday for extended hours she is with many of the teachers. They are all experienced, nurturing and love kids! Stacey has been so accommodating to our busy schedule truly bending over backwards to make everything work for our family! I can’t say enough about Learn and Play! It is a great beginning for any child! As recent newcomers to Acton, we spent a great deal a time researching a preschool for our 3 year old daughter. Learn and Play was by far the best fit for us for many reasons, but we particularly love how the range of activities and amazing teachers make every day stimulating and fun. She wants every day to be a school day! Additionally, Miss Stacey was an exceptional help to us personally in providing information about the town, the schools, and other things that made the transition to a new place happy and adventurous. We could not be more pleased to be a part of the Learn and Play family! My son has been going to Learn and Play since we moved to Acton a year ago. They have a regular school year program and a separate summer program. We sent our son to both last year. He’s made great friends, learned a lot, and has had great experiences. He shares what he has learned at school every day when he comes home. He loves all of his teachers and looks forward to seeing them every morning. Imagimotion comes in every week for learning in music and movement. The play yard is big and they have indoor options for colder or rainy days. The crafts are season and monthly-theme appropriate. They have even made homemade butter with the children when they have made muffins/bread. Parental involvement on special occasions is encouraged, which has worked out great for us. It’s nice to know our son is in such great hands when we leave him in the morning. This is a great preschool… I’m very happy with the care my son gets and I feel like it is the best facility in town! Our 4-year old daughter loves going to Learn and Play! Miss Shelley is fantastic and all the teachers have made her feel special, in particular when she was new. Her interpersonal skills are developing wonderfully and she seems to have an endless number of things to share after each day, from the activities, to songs, to playtime with friends. She loves that she can interact with the children in each classroom and age group. And we especially appreciate the weekly updates, which makes us feel involved, too. Having sampled many of the different options available for toddler and preschool childcare over the years, I can say without a doubt that Learn and Play combines the best of all worlds. Like many small, in-home daycares, Learn and Play provides a warm, highly personal environment for children. But unlike small daycares, Learn and Play provides sophisticated educational resources like the weekly Imagimotion classes, field trips and extensive indoor and outdoor playspaces. There are reasonable rates, a clear curriculum and many different schedule options like many of the large childcare centers. But unlike most corporate daycares, Learn and Play provides small classes and mature, experienced staff who have been there for years. It’s a great choice for any toddler or preschool child. Between our three children our family has experienced five different daycare/preschool programs, and Learn and Play is without reservation our favorite! Our two children enjoy Learn and Play Preschool so much. They look forward to each school day and don’t want to leave at the end of the day. The teachers are warm and caring, the administration is professional and accomodating, and the children are happy! Learn and Play Preschool has been an incredible experience for my children. It is small enough to feel safe and nurturing, and large enough to provide plenty of activities to keep the children engaged and learning. My kids absolutely love coming here.We recommend Learn and Play Preschool without reservation. Cameron started Learn and Play in September 2012. Ms. Lori and Ms. Lisa are very welcoming in the morning and in the afternoon. They are very informative and offer positive feedback regarding Cameron and his school day. When asked, they explain activities and behaviors Cameron experiences every day – always positive. They make me aware that he is doing well and enjoys his time at Learn and Play. Now when I drop him off he says goodbye quickly and goes off to play. When we’re in town doing errands and he sees his school from the car he cries and yells, “My school momma, I want to go to school”! It’s adorable! He loves Learn and Play! The classroom is age appropriate, clean and well organized! We love the separate classrooms and play area! We get an email at least once a week from Ms. Lisa. I love seeing the pictures of Cameron during the school day! Ms. Lisa also sends us communication regarding upcoming events, tuition reminders and any individual information regarding our child. I think it’s great that Cameron is exposed to different age appropriate activities during the day and every Wednesday someone comes into the classroom to play music, sing and dance with the children. Cameron really enjoyed the field trip to Honey Pot Orchards this fall. He loved the hay rides, picking apples and picking out his own pumpkin! Learn and Play organizes great field trip and school events! Learn and Play Preschool has been a wonderful preschool experience for my two children. Whether in the toddler, preschool or pre-k classrooms, the teachers have planed creative and fun activities to fill each day. My kids always come home proudly telling me what they are learning about in school. I also love all the special activities planned-such as the apple picking field trip and the parent breakfast- that allow me to be more involved in their school lives. As a working mom, I am also so thankful for the flexibility Learn and Play offers. I can always depend on the teacher being able to accommodate my need for an early drop-off or extended day….a huge stress reliever! And of course, my kids have developed wonderful friendships with their schoolmates that I am sure will last for year to come. We are excited to drop off both of our boys every day because they are so excited about going to school. We receive frequent emails and pictures from their activities, achievements and special moments. The teachers at Learn and Play take the time to get to know each individual child and family and are invested in the happiness and growth of the children. We are also very impressed with the planning and complexity of the projects the boys work on, such as the “All About Me” book our older son put together and proudly showed us at home today. Our twin boys, Max and Miles, started at Learn and Play about a year ago. Up until that point we had an in-home nanny, however our boys had reached an age which we felt they needed more stimulation, interaction, and socialization. We spent a lot of time researching, talking to, and visiting other local daycares. Learn and Play, hands down, was our top choice for our boys and we’ve been very pleased with our decision ever since. One of the things we like best about Learn and Play is that it is an established daycare with a personal, smaller daycare feel. It started out as an in-home daycare years ago and that intimate feeling still permeates the school today, which is a fabulous thing. It provides the benefits of a larger school, with a very homey and comfortable feel to it. We looked at a number of the larger daycare facilities in the area and each one had a much different approach and feel to it. They all felt too much like a daycare center, with little personalization and much more of a standardized approach. We quickly decided after seeing many of them that it was absolutely not what we were looking for. We wanted something much more intimate, but with an excellent curriculum, a nurturing environment, and caring and knowledgeable teachers. Learn and Play is this perfect place! Our boys are at an age at which they are very vocal about what they like and don’t like. They are always excited to go to school and they talk frequently about the teachers and many of the kids at school. We can tell how happy they are at Learn and Play, and that means the absolute world to us! LEARN AND PLAY PRESCHOOL: A PROFESSIONAL, TALENTED AND LOVING STAFF! AN INSPIRED PROGRAM! A GREAT SPACE FOR LEARNING AND PLAYING WHICH INSPIRES VERY HAPPY GROWING CHILDREN! Learn and Play is a great place for the full development of a child; enjoying words, exploring numbers, forming friendships, experimenting with materials in the world around them are all inherent in natural development. Viveka has be encouraged at Learn and Play to become curious, imaginative and to be a participant in her world over the past 3 years. A key element that is fostered at L&P is the idea of respect – for oneself and for others. The children understand that the school rule of not telling secrets means that everyone is included and the rule about not bringing peanut butter, even if that is a favorite for lunch, protects others. At her insistence (since their recycling unit) we regularly check all plastic for the recycling symbol, and sing the clean up song to make the job of picking up after a project go more quickly – these are just some of the concrete ways they help build this idea of respect. The small class size makes for an environment where each child naturally assumes responsibility and can more readily see the impact they have on others. They are encouraged to bring in things to share, ask questions, and voice opinions. They occasionally have an “assignment” so they can present their work to the rest of the class. The teachers at Learn and Play Preschool provide good examples in their own behavior and fertile ground for the children. As Viveka moves on to the next school adventure she will carry a happy heart, confidence to engage and a healthy curiosity for learning. Learn and Play will never be far from our hearts! My daughter has been at L & P for 4 years! She is thriving and is extremely happy to go to school every day. The teachers provide an extremely loving, nurturing and safe environment for all the children while developing their social skills and confidence. The teachers have so much enthusiasm and work hard every day to help develop each child. My daughter has learned so much-we could not be happier with the experience. Since starting at Learn and Play, we couldn’t be happier with our families experience. In addition to the great activities and educational aspects of our son’s days, we especially love how we’re updated regularly and get to see firsthand how he enjoys his time at school. Every week we get emails with online photo albums from each day, we’ve gotten individual and personal emails from his teachers telling us something specific from that day that was special and, most importantly, our son now tells us each day when we pick him up how much fun he had and all about his friends. Having switched from another school/daycare just a few months ago, this is the best part as it really shows us we made the right decision! We can’t say enough about Learn and Play! Our oldest daughter graduated from Learn and Play in 2009 and had such a great transition into kindergarten. She was thoroughly prepared socially and academically from her time at Learn and Play. She is flourishing! Our youngest daughter is currently at Learn and Play and loving school. The staff is wonderful. Everyone is so kind and helpful. The school is bright and cheery and a joy to come to every day. I would highly recommend Learn and Play to everyone with young children. As an educator myself, I spent careful attention in picking Learn and Play for my children. I taught preschool for 10 years and knew what type of school I always wanted for my three children. Learn and Play is warm and cozy with small numbers like a home daycare, but with the strong curriculum and enrichment activities as a larger preschool. It is the best of both worlds! This balance creates confident young learners who love school and this was evident as my daughter transitioned into kindergarten. Learn and Play is run by experienced and wonderful teachers who create fun and engaging activities and warm and loving relationships. The communication between the teachers and families really involves you in your child’s experiences. With weekly newsletters and an emailed weekly Snapfish album, it is like you are there yourself! The schedules are flexible and whether you choose one day a week or five, your child is involved and part of the class and Learn and Play community! Learn and Play has been a great place for my children to grow and Stacey and the teachers have been supportive of our individual needs as a family. We used Learn and Play Preschool for our son. He attended their 3 year old preschool program and their 4 year old Pre-K program. Though, I believe the school begins with 18month olds. Having only had private in-home childcare and then a private nanny for our older daughter and then our son when he came along, we knew we needed to find a kind, home-like, care facility that would provide a preschool experience, but also childcare for the rest of the day. We found Learn and Play and loved it instantly. The teachers are kind, activities are non-stop and well thought out, and endless projects and creations come home. The school works hard to create a community, not only with the children, but also with the parents, inviting them in for various events throughout the year (both with and without) the children. I really felt they understood my son and helped him to become an excellent friend to the kids there. The teachers are approachable (the owner is local) and I wish I had younger children so I could still be connected with the school. It took us a long time to finally decide where to send our son to preschool. We had looked at a great deal of schools but none were the perfect fit until found Learn and Play. We only started in September but the teachers, curriculum, and overall school environment has surpassed our expectations. We are so happy to pick up our son every day with a huge smile on his face. It means the world to us! Learn and Play is a home away from home for our two girls (20 months and 4.5 yrs). We have been thrilled with the curriculum and especially love all of the creative art projects that come home. The staff is loving and empathetic to the children’s various needs and the level of communication between home and school is outstanding. My older daughter began at Learn and Play in the summer program and we loved it so much we switched her from the preschool where she was enrolled into Learn and Play for the school year. Our children couldn’t be happier and look forward to going to school each day; we couldn’t ask for more. Our son has been at Learn and Play Preschool for over 2 years now and he still looks forward to going every day! The teachers are wonderful and caring. The projects that the kids participate in are thought-provoking and skill-oriented, and the small class room size and child to teacher ratio allows for each child to have sufficient one-on-one time. Overall we have been very pleased with our experience and look forward to sending our 3rd child to Learn and Play as soon as he is old enough! We love Learn and Play Preschool. My almost 4 year old son is in his this 3rd year at L&P and our 3 year old son just started this year as well. Both of them love going to school and are thriving! We as parents love seeing our kids happy. We love the size of the school – big enough for kids to make friends and run around, yet small enough to provide home-like nurturing environment. I especially value teacher’s communication with parents and feedback on what your kids are doing/ learning along with the weekly photos of the children. Best decision made! When we moved to Acton from New York City, we began the daunting task of finding a preschool for our 2 year old son Rowan. He had already been in day care and so we knew what we wanted : a nurturing, safe place where he could spend his days having fun, but we also wanted a preschool structured enough to begin teaching him the foundational skills for learning. We were so thrilled when we discovered Learn and Play and knew immediately that this was the place for him. Now in his second year, our son loves going to school. He adores his teachers, loves all the wonderful projects and activities that keep him busy all day long, and has made close friendships. We are amazed by how much he is learning every day. His transition to a new school was seamless, and that is due in large part to the caring teachers at Learn and Play. We are just so grateful to them for making his school experience such a joy. Learn and Play and now that he is about to turn 5 and in the midst of the Pre-K curriculum, we are constantly impressed at how much he continues to learn. The projects are creative, the children have input on what they will be creating and learning, and all while having so much fun! We are so pleased that we sought out another childcare and preschool option for our son. Our experience at Learn and Play has surpassed the experiences we had at the centers our older daughter attended. Learn and Play has become a second family to us! Our family recently moved to Acton from out of state. One of the most daunting tasks upon our arrival was finding the perfect preschool for our child. We had often driven by Learn and Play Preschool and had admired its charming and inviting exterior and playground. We attended an open house and were immediately welcomed by warm, caring teachers and a beautiful, clean, creative learning space. We have a great amount of trust and comfort in Learn and Play and in our child’s teachers. It’s incredible to see how many innovative, fun, creative, and enriching activities the Learn and Play teachers always have ready for our child to enjoy. We couldn’t be more pleased with our decision to enroll our child at Learn and Play Preschool. Learn and Play has been such a wonderful experience for my whole family. My husband and I knew on our first visit that our three year old would fit in perfectly. The huge playground in back and the loft in the preschool room are huge hits! Miss Elaine, Miss Amie and Miss Amber are so creative, flexible and nurturing. Adeline loves going to school! There is nothing better than watching your child eagerly walk into school and feel comfortable within minutes. She gives me a hug and kiss, a wave and smile and she’s off. We couldn’t be happier! Learn and Play has exceeded all of my expectations. We are always greeted with warmth and kindness when we walk into the classroom. My children flourished at Learn and Play. The teachers create a nurturing, creative, educational, fun and loving environment. The teachers cared and loved each of my children as if they were their own. I will forever be grateful to L&P. We feel fortunate that our daughters are part of the school. Thank you for taking such good care of them.